Where is hardest place to catch taxis in Seoul? Seoul residents find it most difficult to grab taxis at night near Gangnam Station, followed by the areas of Jongno, Hongik University and Itaewon, according to a recent report by Kakao Mobility and the Seoul Digital Foundation. The report on the imbalance in demand and supply for taxis at night in Seoul was based on data from Kakao’s taxi ride-hailing app from November 2017 to October 2018. It was toughest to grab a taxi near Gangnam Station at midnight, with demand on the taxi-hailing app higher than supply, according to the report. In the Jongno area, demand for taxis peaked between midnight and 1:20 a.m.
Offices, shops, bars, clubs and other entertainment facilities are concentrated in Gangnam and Jongno, where many office workers hang out with their friends and have office get-togethers and business dinners. At nightlife spots, demand for taxis exceeded supply slightly later. It was most difficult to get taxis at around 2 a.m in Itaewon, and 1:30 a.m. for the Hongik University area. Demand for taxis continued to be high until 5 a.m. in Itaewon, the study showed. In contrast, demand started to subside at around 2 a.m. in Gangnam and Jongno. Meanwhile, passengers were refused rides by cab drivers mostly when they hailed taxis for short-distance trips, according to the study. Amid growing complaints, the Seoul Metropolitan Government is cracking down on such practices. 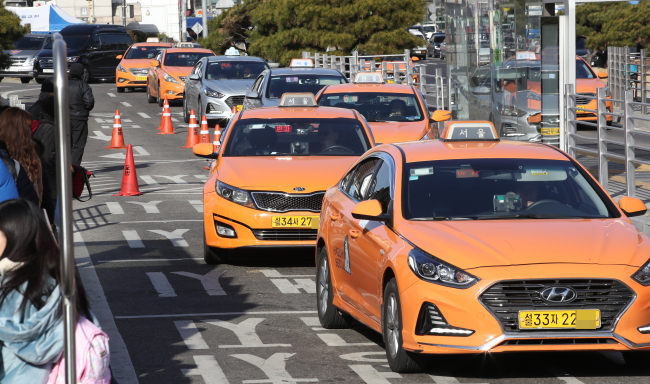 Seoul enforces a “three-strike” system, in which drivers caught refusing passengers on three occasions within two years could face the suspension of their business or cancelation of their taxi licenses. The report advised the municipality to diversify public transport options, such as short-distance buses, shuttle bus services and ride-sharing services. The city government estimates that about 6,800 more taxis are needed at night.